REGION — The San Diego County Board of Supervisors won’t render a decision about a controversial proposed development near Valley Center in 2018, county officials announced. The board was slated to consider 1,700-home, master-planned community known as Lilac Hills Ranch on Dec. 12, when it was also scheduled to weigh in on developments in Otay Ranch and Warner Ranch. But the county’s Planning and Development Services department announced this week that they were pulling all of the projects off of the calendar due to varying reasons, from staff workload to litigation involving the county’s climate action plan that directly impacts their approval. “These projects will not be heard by the Board in 2018 due to varying reasons such as staff workload in preparing some of these projects, the County’s Climate Action Plan litigation and the injunction which applies to the PSRs, and applicants continuing to provide additional information to staff for their projects,” according to a department statement. There is no current timetable for the board to hear the projects. 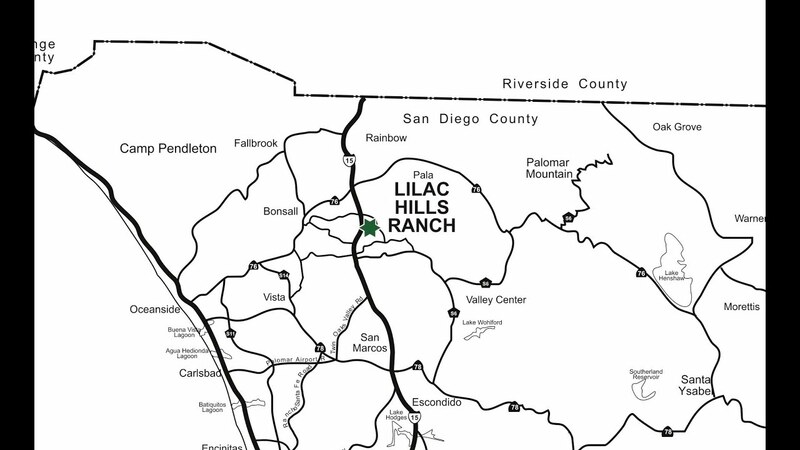 Lilac Hills Ranch calls for 1,746 homes and a 200-unit assisted living facility on 608 acres in the largely rural area adjacent to Valley Center and south of Fallbrook. 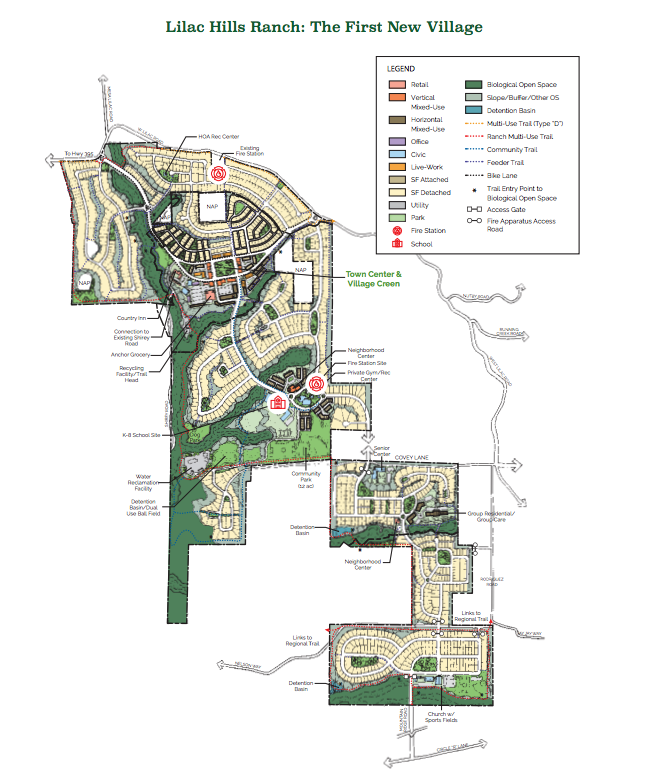 It also includes more than 200 acres of parks and open space and 16 miles of trails, three community centers and pools, a village square and 90,000 square foot of retail, office and commercial space. Voters rejected a previous iteration of the project in 2016 when they voted down Measure B. The project now under the control of a new development team, Ranch Capital LLC, and its subsidiary, Village Communities. Ranch Capital was a financial backer of the earlier version of the project headed by Randy Goodson of Accretive Investments. Goodson and Accretive are no longer involved. Following the Planning Commission’s approval of the project in 2015 with several recommendations, the developer at the time, Accretive Investments, pushed for a ballot initiative as opposed to fully incorporating the commission’s provisos, which included a turnkey K-8 school, lowering fire response times to five minutes from the proposed 7-9 minute time estimated by developers, as well as several private and public road improvements. Voters rejected the ballot proposal in November 2016. The developer unveiled its revised plan in early 2018, boasting that it was the “county’s first carbon-neutral village in San Diego County and the first community to meet the county’s guidelines for New Villages, which is the highest standard a project can achieve under the County’s General Plan,” according to the website. Among the changes from the former project included the installation of electric vehicle charging stations at every residence, rooftop solar on every residence and 45 percent of non-residential building roof space, implementing a variety of carpool, transit, and vehicle-sharing programs, and achieving carbon neutrality through the purchase of carbon offsets. The County Planning Commission voted 5-0 in June to advance the plan to the Board of Supervisors amid objections from residents – and against staff’s recommendation that the group hold more hearings to address changes from the failed ballot measure and current project. But the commission sided with the developer and dozens of residents who spoke in favor of the project, which they said hadn’t materially changed due to the changes. Fallbrook resident Paul Schumann said he likened the changes to the project to cosmetic improvements on a car. Whatever pretty little description the developers might invent regarding this mess it’s just more ugly sprawl.